Over 30 years of experience. Call us at 512-351-9526. View specialty pool examples. Call us at 512-351-9526. Ready to get started? Call us at 512-351-9526. Have the perfect spot in your yard for a beautiful pool? Let Aria Pools fill that space for you! Aria Pools offers beautiful custom, professionally designed pools and spas. Find that "something extra" to make your pool unique. A Water and Fire Feature is a great way to add beauty, elegance, and that special touch to your custom swimming pool. Ready for the swimming pool you've always dreamed of? See the sunlight sparkle in your swimming pool by day and a beautiful glow reflected by your pool lights at night. You will work one-on-one with our expert pool designer. Our designer will learn about your vision, your backyard space, your budget, and your timeline. Then Aria Pools will create a unique plan to make your dream a reality. Aria Pools’ success with our custom pool designs can be measured by the growth of our company. Throughout the 36 years we have been in business, we have steadily grown and it has been mostly through client referrals. 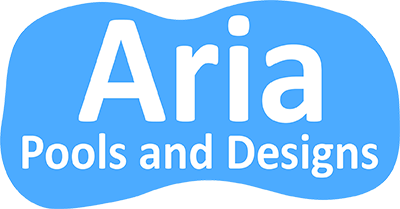 Aria Pools & Designs, a Van & Van Austin Company, has provided over 30 years of local reliable, quality construction to customers in Central Texas. Our service area includes cities such as: Cedar Park, Austin, Leander, Lago Vista, Liberty Hill, Round Rock, Georgetown, Hutto, Marble Falls, Manor, Kyle, Buda, Lakeway and Spicewood.